The Mercedes Benz V-Class, ‘Luxury Multi-Purpose Vehicle’ will be offered in 6 and 7 seat long wheelbase and extra-long wheelbase variants in India. Mercedes Benz has today launched the V-class ‘Luxury Multi-purpose vehicle’ in the Indian market. 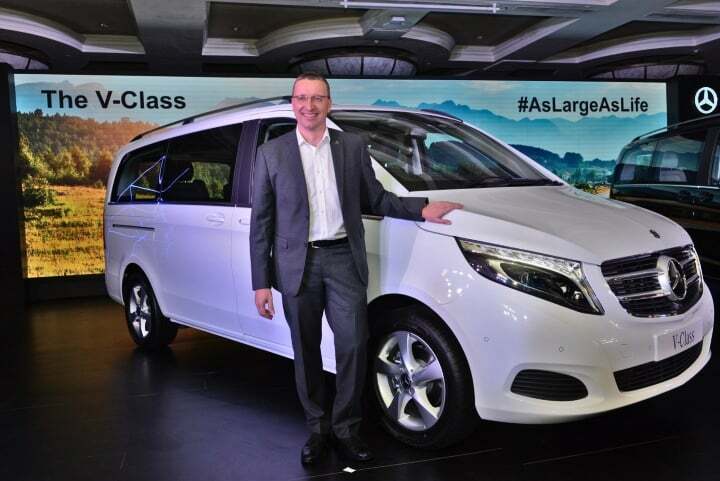 The premium MPV from the German automaker goes on sale in India in two variants. These include the 6 and 7 seat long wheelbase (Exclusive) and the extra-long wheelbase (Expression) trims. Prices for the Expression starts at INR 68.40 lakh. While the prices for the Exclusive start from INR 81.90 lakh (ex-showroom). The Mercedes Benz V-Class comes with a 2.2-litre, diesel engine which is capable of churning out 160 BHP along with 380 Nm of peak torque. The long wheelbase iteration, i.e. the Exclusive trim comes with a wheelbase of 3200 mm along with a length of 5140 mm. On the other hand, the extra long wheelbase gets a wheelbase of 3430 mm along with the length of 5370 mm. On the safety front, the Mercedes Benz V-class comes with V-Class comes with 6-airbags, attention assist, active parking assist with 360-degree camera and Pre-Safe. The V-Class will goes on sale in India in a total of Obsidian Black Metallic, Cavensite Blue Metallic, Mountain Crystal White Metallic and Brilliant Silver Metallic.